Working in the cloud is not just a matter of reducing costs once when you migrate your workloads. It is a matter of constant adjustment to gain all of the cost benefits that AWS makes available to you. We call this process cost optimization—the active oversight of costs as your organization and its market change, and as your company’s success leads to growth and innovation. The cloud is as dynamic as you are, so cost optimization requires monitoring and adjustment. AWS provides tools to help you take full advantage of your opportunities to reduce costs. In the post below, Erin Carlson explains how to use those tools to gain visibility into your cloud infrastructure and how you can save money through advance reservation of instances (RIs). 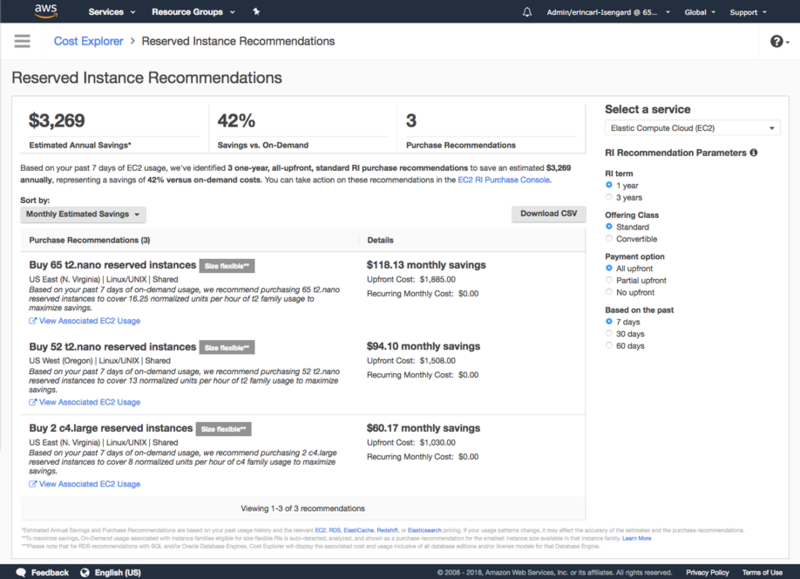 AWS Reserved Instances (RI) offers you a discounted hourly rate (sometimes up to 75%) compared to on-demand usage in exchange for committing to a one- or three-year term of service usage. In the previous post, I covered how you can monitor the performance of your overall RI portfolio by tracking your RI utilization and savings. In this post, I will focus on how you can build on the insights gleaned from analyzing your utilization and savings to take action on opportunities to increase your RI-related efficiency. This process is often conducted in three steps. Using this three-step process, you and your team can identify opportunities for additional cost savings by accessing and taking action on your RI purchase recommendations, analyzing your overall RI coverage via AWS Cost Explorer, and monitoring your RI coverage using AWS Budgets. 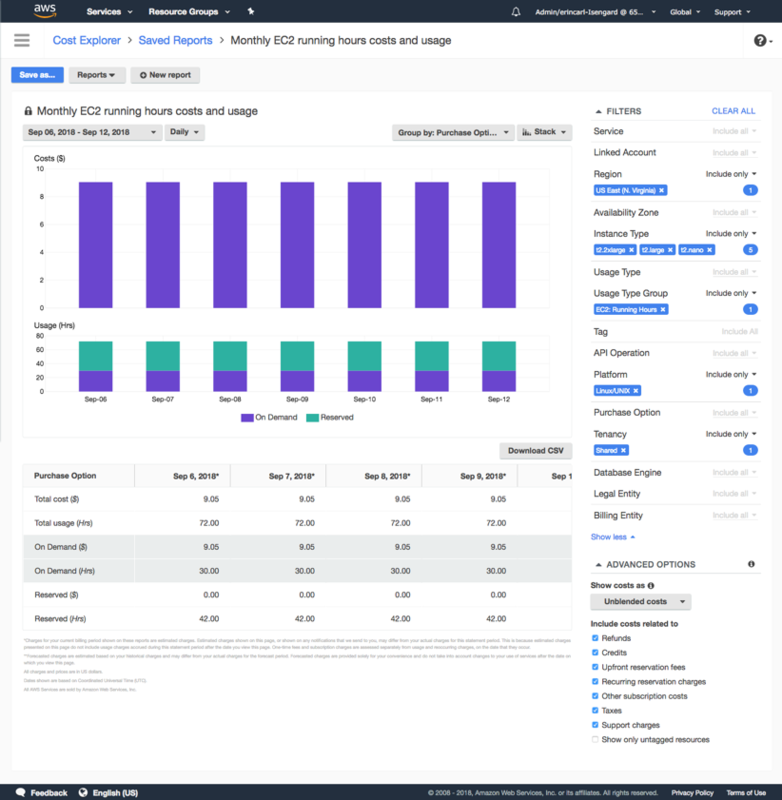 AWS Cost Explorer is an easy-to-use interface that allows you to visualize, understand, and manage your AWS costs and usage. For RI customers, Cost Explorer further provides detailed information with respect to RI-related savings, utilization, coverage, and beyond. If you have been following along from the previous post, you have already gained deep insight into your RI utilization patterns and savings. This post will show you how to access system-generated RI purchase recommendations and inspect your overall RI coverage using Cost Explorer, enabling you to identify and monitor optimization opportunities across your RI portfolio. If you are looking for ways to optimize your costs, Cost Explorer’s RI purchase recommendations are a good starting point. To access your recommendations in Cost Explorer, click on the hamburger button in the top left corner to open the lefthand menu. From there, you can click on the particular service for which you would like to view recommendations. Cost Explorer automatically generates RI purchase recommendations for you, which are based on your historical usage. These recommendations are calculated by analyzing all incurred usage eligible to be covered by an RI (e.g., on-demand usage) and algorithmically simulating possible combinations of RIs that would cover that usage. This is done by simulating the addition of an RI to cover that usage, calculating the new cost, comparing the new cost to the previous cost, and then repeating the process by adding a new RI to determine if additional cost savings are available. This process continues until the recommendations engine arrives at a scenario that yields the lowest total cost and the highest savings. Please note that these recommendations also auto-detect usage that is eligible for size-flexible benefits (Amazon EC2 and RDS) and factor in any identified savings. You can further adjust your recommendations to evaluate a specific set of RI parameters, including the RI term, offering class, and payment method, as well as changing the underlying dataset upon which your recommendations are calculated, basing them on the past seven, thirty, or sixty days of usage. By customizing these parameters, you can arrive at the set of recommendations that are most representative of your business patterns and goals. From here, you and your team can analyze individual recommendations to determine whether it would make sense to purchase a reservation to cover matching usage. This will provide a breakdown of the costs and purchase options associated with all usage that matches the recommendation parameters. In the usage chart, the purple bars indicate how much of the visualized cost is billed at normal on-demand prices, while the teal bars indicate the usage the received the discounted hourly RI rate. Using this information, you and your team can proceed directly to the individual service console to complete your purchase of the recommended RIs. You can also refer back to the RI Utilization Report discussed in the previous post to determine whether you have any underutilized RIs that you could modify to better cover these instance types. Now that you have accessed your RI purchase recommendations, you can then dive deeper into your RI portfolio and any associated cost saving opportunities using Cost Explorer’s RI Coverage Report. The RI Coverage Report visualizes the percentage of running instance hours that are covered by RIs over the time period that you define, and allows you to define your own coverage threshold (the red line visible in the screenshot below). Using this report, you can view your RI coverage at a high level (e.g., across all running hours) or dive into a detailed view by filtering on account, instance type, region, tags, and more. Using this report, you can determine how well you are tracking against your RI coverage goals. You can also dive deeper into your usage by identifying under-covered instance types and viewing their associated on-demand costs. This will help you to prioritize which instance types to focus on along your optimization journey. Once you and your team have set and reviewed your RI purchase recommendations and analyzed your coverage trends, it may then be time to monitor your progress toward your goals. RI Coverage alerts (available via AWS Budgets) allow you to monitor your reservation coverage both in aggregate (e.g., receive an alert if your average Amazon EC2 reservation coverage drops below the 33% target defined earlier in this post) or for a particular set of reservation specifications (e.g., Amazon RDS RIs scoped to a particular region). Please note that the process of setting an RI Coverage alert is similar to the process described in the previous post for setting an RI Utilization budget. You can refer to this post here. AWS provides numerous tools to help you manage and monitor your RIs. 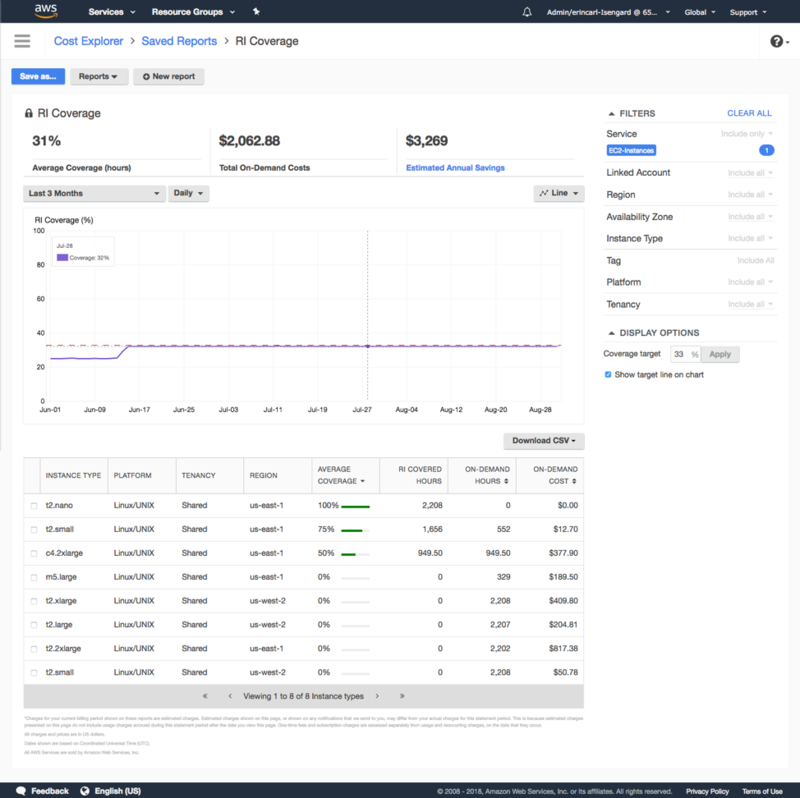 This post demonstrates how you can use AWS Cost Management products to identify and take action on optimization opportunities by accessing Cost Explorer’s RI purchase recommendations, diving deeper into your RI coverage using Cost Explorer, and monitoring your RI portfolio using the alerting capabilities available in AWS Budgets. These tools will help you expand your ability to manage and monitor your RI portfolio, while also helping you to identify and act on opportunities for greater RI-related cost efficiency. To learn more about tools that can help you and your organization better manage your costs, please visit the AWS Cost Managementweb pages. To learn how you can access RI purchase recommendations based on your AWS usage using AWS Cost Explorer, please visit the Reserved Instance Reportingweb page. Erin Carlson is a Product Marketing Manager for the AWS Billing & Cost Management experience. She works with customers to provide helpful guidance and resources around accessing, analyzing, and optimizing their AWS costs and usage.